We are making our Himalayan home into a hub for personal growth. We’re crowd-sourcing the name. Imagine a serene place where people will come to learn and grow. An inspiring learning space, this will be a future home to many types of Himalayan Retreats ranging from mindfulness to astronomy to writing. Among other things, we will host a writing residency. The Himalayas are a great place to connect with yourself. Dr. Vandita Dubey, a published author & US licensed psychologist, will lead the “Inner-You” programs. She currently offers residential and phone/skype therapy for individuals and couples (www.vanditadubey.com). If you want to strengthen your relationship or want to use writing as a form of self-development, you could do it here. Before picking a name, you need a full flavour of the place. Vegetables grow in a garden patch irrigated by recycled water. Lemons and their fragrance hang from overloaded trees. You may hear bees buzzing around blossoms which will soon become fruits. Clucking chickens punctuate the melodious birdsong. Two playful non-pedigree dogs chase away a cat trying to turn a freshly hatched chick into lunch. The fresh honey you have for breakfast tastes particularly good. You learn it’s from bees bred on the farm. You realize you are in the company of the birds and the bees. You ask for learning of a different kind. Your request is, sadly, denied. That evening you sit at what would be a “sunset point” in any tourist town. The sunset makes you wonder how all colors could come from only three. Later that evening you eat your dinner while watching the Himalayan moon rise over the black ink of the forest reserve next door. The next morning you may choose to wake up to the crowing of the rooster and witness a sunrise no photograph could ever capture. You feel inspired without leaving your warm quilt. Later in the morning – after a hot breakfast – you start your activity in a small group of less than 10 people. Except the bird-watchers or the astronomers, who may may follow a very different schedule. Both Vandita and I believe in giving back to this community we are a part of. We are committing 5% of our revenue to local NGOs. We vet them, and know many personally. Instead of paying us the full charges, guests are free to donate 5% of our charges directly to the NGO’s we recommend, and pay us only 95 %. Our first beneficiary is the Chirag school, about which I had written in https://uncityblog.wordpress.com/2018/01/31/a-joyous-unafraid-childhood-and-the-school-that-allows-it/ . So, which of these names do you like best? Please reply by commenting with the name you prefer. If another compelling name comes to mind, feel free to share it. Once all votes are in, we’ll put out a post with the winning name. Note : All pictures in this post were taken by us from/of our home. I just filed my taxes. My income has fallen. In corporate jargon, we have sustainability issues. I live in a Himalayan village. Everything around is incredibly beautiful. Most people who come through envy our life. But I cannot eat the view. I also cannot use it to pay for my kids’ education. That’s okay because I am the eternal optimist who believes that things will get better. But the tax return did make me think about the trade-off between money and happiness. As I pondered, I came across a diagram for work, money and happiness. It hit home. I have created this version of it. Most of it is pretty clear. The “Dreaming” box means you may have a passion for something, and money can be made from it, but you’re no good at it. My ability with music is a great example. I’ve joined guitar classes six times and still can’t play. I’ll never make it to the rock-n-roll hall of fame. But the boxes here are not an end state. The box you’re in now is a starting point. You could be very happy in your box. If not, move. It’s the difference between “As is” and “To be”. (Apologies for the corporate jargon. To my credit, I did replace “monetize” with “make it pay” in the picture below). The goal is to alter the box we are in. The quest is for the “JOY” box – that ideal combination of Passion, Excellence & Money. We wont discuss how much money. Let’s just say its personal and move on. Let me take a few examples from my own life. I was in the “rich but stressed” box. I could sound passionate about a revenue target, but I was faking it. You cannot fake your way into a passion. I was lying to my boss, my team, and myself. So I walked away. I found myself in the ”Happy but poor” box. I now pursue various passions / projects to seek out joy. Writing. It doesn’t pay. My first book did well but earned peanuts. 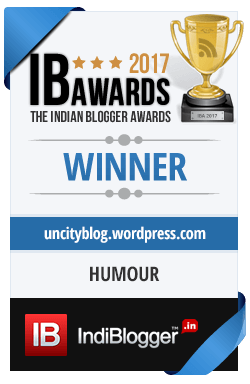 This blog has earned nothing except the indiblogger award for humour. The award is also inedible. So I hope my next book sells more and I can make peanuts2 from it. The fact is, I write because it’s fun. Even if I earn nothing. Happy but poor. The Himalayan Writing Retreat (THWR). I am working hard to grow THWR. It is one way of trying to make writing pay. I love teaching, and I know the retreats are good because the participants love them (on facebook we’re rated 5/5). But the problem is marketing – I have to improve that. I’m working on it right now. I can’t eat the view but it does help me sell and monetize (uff). Once that happens, I will reach the joy box. Professional Speaking. This is something I really enjoy. It can pay as well. My initial talks were terrible. I am working hard and getting better. This 4-minute talk is amongst my better ones. I hope to start earning from it now. I expect my next book to boost that. So Professional Speaking is the “dreaming” box where I am trying to excel. The Himalayan X retreat. We are creating a yet-to-be-named learning destination around our home in the Himalayas. This is a place where people will come to learn. And grow. The rooms and learning spaces will be the future home of many thing writing. We hope to offer writing residencies, and various other writing related programs such as script-writing. We may also do other things on the side like bird-watching & photography. This is emerging from the dreaming box right now. We have to built it and now it has the potential to give us joy. Cheesemaking is a big one. My partner Nitin Dayalu and I have recently started producing cheese locally. Nitin also walked away from the “Rich & Stressed” box around the same time as me. His wisdom came earlier in life. The cheese we make is organic – from the awesome milk we get here. Nitin is deeply passionate about this, and it is his baby. He can – and has – run this business on his own. I am passionate about entrepreneurship, and this start-up really gets me going. I am a handy sounding board for him. For us the goal is to make the project pay enough that we can live by it. And we want to add to the local community in a meaningful way. Again, we are in “happy but poor”, looking for Joy. Our branding, of course, has a cheekiness which some of you may expect by now. One person I definitely know who is in the “Joy” box is Sumit Bansal. He quit IBM to become a full-time blogger on MS Excel. He excels at blogging (hee hee). He is passionate about his work and makes good money from it. We are jointly hosting the Himalayan Blogging Retreat on April 18-22 (details here). In all the examples above, the goal is beyond mere wealth. Because we are passionate about what we do, we hope to find joy. We may not excel at every aspect of our work, but we’re getting better. As I strive for Joy, it is surprising how much fun the striving itself is. That effort to make something new and beautiful where nothing existed is enriching. And much more satisfying than my last “job”. So what box are you in? And what will give you joy? Feel free to share your comments. Step 1 : Buy the land. Look at land options and finalize one. After that falls through at the last minute, find another. Clinch that and do the registration. Within six months someone will file a legal case against you. That person will claim to own the land you bought. This will happen despite your most thorough background checks and clean papers. Hire a lawyer and fight the case. Assuming a stay is not issued, proceed to step 2. Step 2: Design the house. Scour the internet, which will offer wonderful mountain home ideas, most of which will not be doable by the local building talent. Talk to local pahadi architects who are practical and will ensure you have a structurally solid house. But these folks are conservative and will insist on small windows. Unsatisfied with these architects, send your land survey files to architects all over the world (the Dutch are the current favourite). Over skype, you find their thinking resonant with yours. They will send you amazing designs which look brilliant in 3D renditions. They will, of course, do this without actually visiting your land. Do not discuss these designs with local people or you may discover that these designs are utterly impractical. They may also be insensitive to the ecology and to the local people, but thankfully you will never find out. Proceed with the most awesome architect at dollar rates. Step 3 : Hire a contractor. Look for a decent contractor. Talk to four pahadi contractors. Realize that they all seem rather shaky and imprecise in their quotations and work style, and offer no references. Look further for a “professional contractor”. Realize that evolution hasn’t created that species yet – except the Parsis who produced Hafeez Contractor. But he is actually an architect. Go figure. Hire the contractor who seems the best of the lot. Tell him (They’re all men) that your expectations are very high. Set milestones and link them to payment. Pay the advance. Start the project. Call the contractor regularly. He will assure you that all is going well. Be shocked at the slow progress on your six-monthly visit of 1.27 days (average). Realize that the contractor cannot read the drawings, so he does his best based on what he could guess from the lines on the page. Be patient and civilized with the contractor. Increase your visit frequency to every 4 months, and extend each visit duration to 2.27 days (average). Start flying in on a rental helicopter to be more efficient. After the contractor misses the first 3 milestones, realize that things are not going as per your plan and the structure looks nothing like the glitzy 3D image you saw. Give the contractor a last deadline. He will miss it. The distressed look you wanted on your furniture is now on your face. Step 5 : Fire the contractor. After you fire him, you have three options. A, Look for another contractor. All the best. They’re all equally bad. B. Decide to do the project yourself. You might as well buy that chopper now instead of renting it. C. Abandon the project. Take solace in the fact that the mountains are littered with half-finished dream-turned-nightmare projects. With option A, loop back to steps 3-5. With option B, move to step 6. The best is Option C as you cut your losses. Step 6: Become the contractor yourself. Look for workmen in the mountains, sitting in the city. You will need people for civil work, carpentry, electric, plumbing, stone work, Metal work, Tile work, painting, solar, windmill and other myriad things. You curse the Dutch and drop the windmill from the grand plan. Masons, carpenters and everyone else will promise you dates and times, and not show up. This will happen repeatedly as your hair thins, and the little that remains turns grey. When they do turn up, they will give you lists of things to get, which you will duly order. Then they will tell you that they forgot one critical thing without which the work cannot proceed. Nothing is available locally, so you will lose 2 of your planned 2.27 days trying to get the missing bits. You will also be surprised at the contractor’s (Let’s call him your Ex – after all he screwed you) bad business sense. You discover that the margins are over 150%! Why would your Ex walk away? Check Linkedin for your Ex’s profile to see if he earlier worked at Fortis, Max or some other private hospital chain. Realize that your Ex is not on Linkedin. Step 7: The house is finished. And so are you. After some weeks as the travelling contractor, you have found some decent craftsmen in the mountains, and a good psychologist in the city. The psychologist is US returned and charges dollar rates. As the months pass you reduce your trips to the mountains and increase your visits to your shrink. She (they’re all women) says you should rest and advises against travel. You have developed a strange fear of heights. You now choose to take your 2.27 day vacations (average) by the sea. You put your mountain structure-thingy on the market and hope to sell it, and kiss your mountain-home dream goodbye. But you now have the bragging rights. At dinner parties you boast of the house you own in the Himalayas without making eye contact. Sometimes you throw up while doing so. People assume you have mixed your drinks. Epilogue: After 4 years, your incomplete house still hasn’t sold, because rich, delusional city-dwellers all want to build their own dream house and not buy something half finished. Although they have no time to live in such homes, leave alone build them. You take a morphine prescription and visit the area again. The shell of your dreams is still standing, now over-run by creepers, weeds and algae. You stay at a nearby resort, paying a pittance for a lovely, well finished room with a grand view. The resort has great food, but somehow the taste in your mouth stays bitter. You try not to think about the return you would have got from putting the 0.37 Gazillion which your non-house cost into the stock market or bitcoins. You leave out the psychologist’s fees – subconsciously. You also try and not think about all the vacation time (n*2.27 days) you lost on the futile project. Note : The above steps are based on a true story. Actually, many of them. I promised to tell you how to build a house. I never said you would actually live in it. About the author : Chetan Mahajan* is a full-time writer and blogger who has been renting a house in the Himalayas for the last 3 years. He has also bought land and built his own house there over the last 2 years. At the time of going to press, he had just sacked his contractor. He still hasn’t moved in. Late at night, he sometimes applies Maybelline lipstick on his lips and whispers “because you’re worth it” to himself in the mirror. And pouts. His wife is a US licensed clinical psychologist who has a thriving in-house practice. *Chetan also hosts the Himalayan Writing Retreat. A joyous, unafraid childhood. And the school that allows it. “Our 2nd graders reading is seven times better than the national average.” Said the principal. “Seven percent, you mean?” I corrected gently. “No seven times.” He said, reeling out some data*. But how can a Hindi medium village school where the teachers don’t even raise their voice pull this off? The Chirag school started as a unique experiment. Could kids from a village learn in a fear-free environment? If rote learning was replaced by experiential learning, wouldn’t the villagers resist it? Could the principles of J Krishnamurti – which work so well in schools like Rishi Valley – also work in a no-frills rural school? Today, ten years on, the experiment has been an unbelievable success. Chirag’s kids are an incurably curious and fearless lot. Their parents love the school and it’s method of instruction. The school outdoes state and national measures on all academic metrics (*see data points below). I was at a parents meeting at the school last month, and there was some mention of the school going beyond grade 5. A parent whose kids had moved out of Chirag to another school (after grade 5) said she would pull the kids out of the current school and put them back in a heartbeat. After the meeting, another parent confided in me about how that lady in the early days was the one who always pushed for more homework from the school. But after her kids blossomed at Chirag, she clearly values it’s non-rote teaching methods now. Chinmaya Vempati is a 16 year old intern from Bangalore who helped set-up an offline version of Khan Academy, KA Lite, at the Chirag School. He shared his experience here. Chirag’s ability to attract and retain great teaching talent has made it a fabulous place to learn. Sumit Arora, 30, is a great example. An SRCC graduate with a Masters from Azim Premji University, he could be anywhere. That is Sumit in school. And that is NOT how I remember my principal. But he chooses to lead this amazing little school. And inspires everyone around him. Beth, the former assistant principal at the American Embassy School, volunteers full-time at Chirag. The teachers at Chirag are driven. We saw a great example this month. Since the Chirag School is only till grade 5, kids have to switch to other schools in grade 6. The most coveted is the Jawahar Navodaya Vidyalaya – a government run chain of residential schools which are almost free. The Navodaya entrance exam – with a pass rate of 2% (Link here) – is on Feb 4, 2018. Chirag has its annual vacation through January. Two Chirag teachers volunteered to help the kids prepare for the Navodaya entrance through the vacation. Both of them came to school everyday of January – including Saturdays. They did this free – for their students and their beliefs, not for money. Since Chirag kids are not used to exams, the teacher’s support was critical. Almost the whole of grade 5 turned up on most days through the semi-polar January. No wonder Chirag kids do exceptionally well in this exam. For a school which is able to deliver all this, the Chirag School runs on a tiny budget. The holistic, progressive education of a child in the Chirag School costs Rs. 24,000 per year. With 122 kids, that is an annual budget of 30 lakhs. Most parents can pay precious little. The Chirag organization has been supporting the school 100%. But that support is now diminishing because of internal priorities at the NGO. The school needs money. It is raising funds for the next two years, and has also set-up an endowment fund. My kids go to Chirag. I was heading the School Management Committee (SMC) for two years. I can vouch for the school and everything is delivers. In fact, Chirag is the reason we chose to live in these parts when we decided to leave Gurgaon for the mountains. Please support this amazing school. You can learn more about the school and find payment links at www.chiragschool.org.